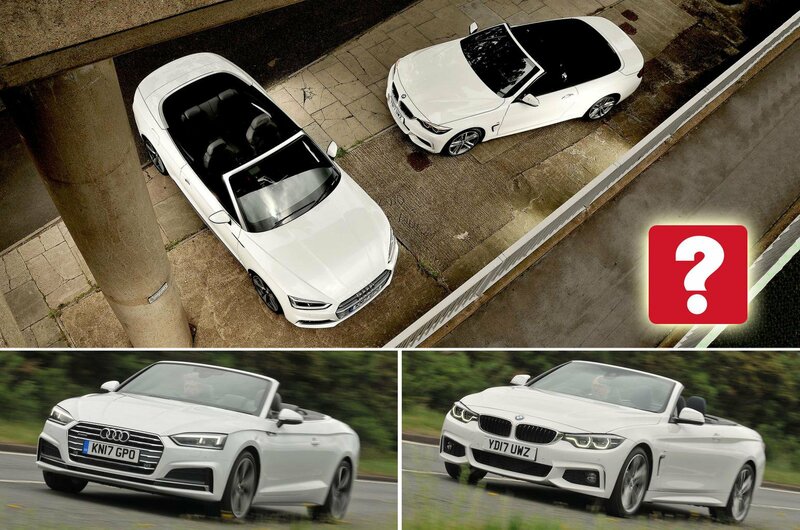 Audi A5 Cabriolet vs BMW 4 Series Convertible | What Car? These are interesting times in the convertible class. 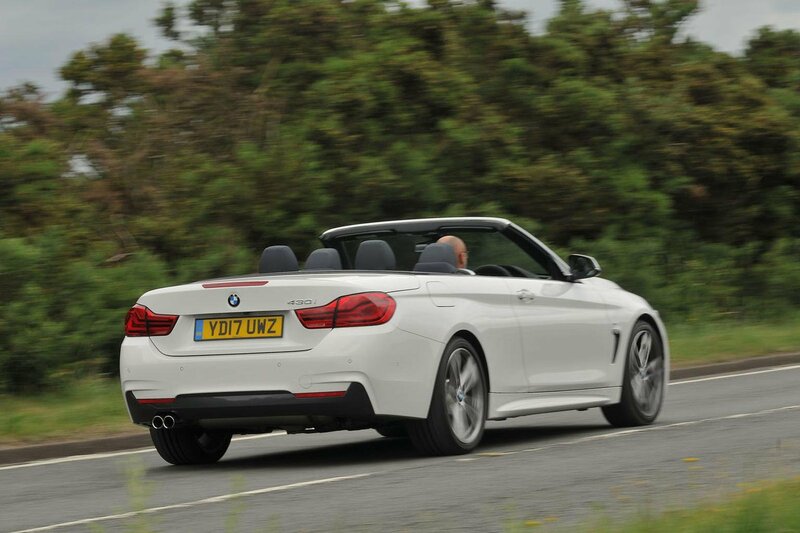 A whole host of new premium drop-tops are arriving this year, so the class crown is there for the taking. Audi has already proved capable of providing luxurious interiors and a pleasing driving experience with the A5 Coupé, and this latest A5 Cabriolet has the same great innards and underpinnings. Looking to keep the A5 in its box, though, is BMW’s recently facelifted 4 Series Convertible, which benefits from tweaks to its interior, kit list and suspension in a bid to stay competitive. Both cars have 2.0-litre petrol engines that pump out a whisker under 250bhp, but BMW’s choice to give the 4 Series a folding metal roof gives it a considerable weight penalty over the fabric-roofed A5. It’s not surprising, then, that the latter builds speed more swiftly when you need to overtake a lorry or join a motorway. The fact that the A5 has four-wheel drive also means it can scamper away from the mark quicker than the rear-wheel drive 4 Series – especially when the road is damp. The 4 Series’ engine sounds gruff when you accelerate and you feel vibrations coursing through the steering wheel and pedals; you could almost mistake it for a diesel. By comparison, the A5’s petrol engine is silky smooth at any revs and sounds much sweeter when you work it hard. However, there’s nothing wrong with the 4 Series’ automatic gearbox, which flicks between its eight gears intelligently when left to do its own thing and is quick to oblige when you want to change gear manually by pulling paddles behind the steering wheel. The A5’s automatic gearbox may have one fewer gear to call upon, but most of the time it’s an equally impressive companion whether you take control or not. It can be slightly more jerky when you’re parking, though. The 4 Series’ extra weight has an impact on its handling, too. Sure, its steering has a more natural feel, but it struggles to change direction with as much gusto, while the A5’s superior traction out of junctions and corners helps you to change direction with greater confidence. Fitted with the firmest suspension offered on each model and riding on optional 19in alloy wheels, neither car’s ride is ideal on UK roads, but softer set-ups are available for no extra charge. The 4 Series is harsher over sharp bumps where the A5 manages to take the edge off, but the A5 is generally firmer, so you feel more small imperfections as they pass beneath the car. Both cars have relatively stiff structures by convertible standards, but you do feel a few more wobbles through the A5’s body on scruffy roads. The 4 Series’ standard run-flat tyres generate quite a lot of road noise at higher speeds, even with the folding metal roof erected. 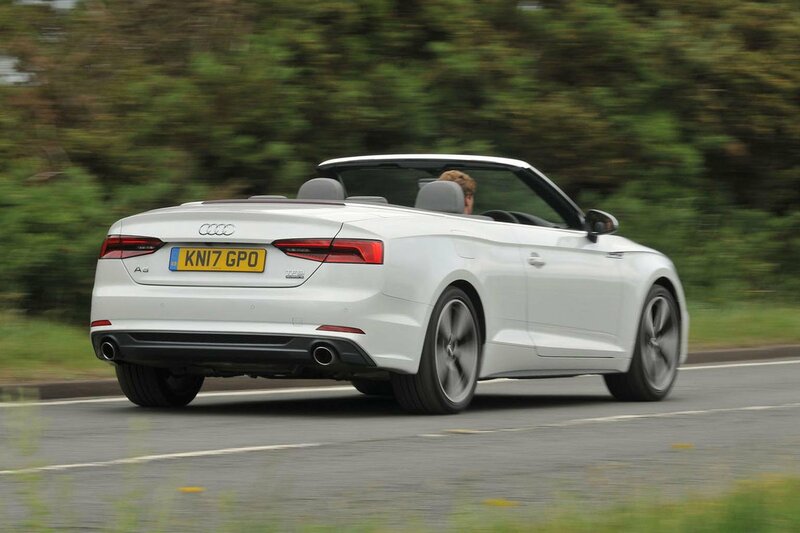 The A5’s fabric roof lets in more wind noise, but there’s slightly less road noise. The 4 Series’ roof works at speeds of up to 8mph and takes 29 seconds to go about its business, whereas the A5’s top takes 19 seconds and can operate at up to 31mph. Roofs down, the BMW does a slightly better job of keeping four people bluster-free up to around 60mph, although rear passengers are inevitably blown about more than those in the front. Both manufacturers charge extra for a removable wind deflector, but no one can sit in the back when they’re in place.